This weekend is the first weekend of autumn, here in the Northern Hemisphere. The baseball playoffs are around the corner. Football season is with us again. And who isn’t interested in team rankings? The Chicago Cubs—fingers crossed!—are in the playoffs, in a wildcard spot! And whether you enjoy college football or pro ball, rankings are certainly something much discussed, in news columns, on television, and in personal conversation. What if you do not care for sports? Have you or one of your relatives looked at Yelp lately, to check out that new restaurant down the street, and see how many stars the restaurant gets? What about U.S. News and World Report’s rankings of the top colleges in the country? Face it, this mentality has transferred to the church, too. Who’s the top ranked preacher in the country? Does the church down the road make it on to the list of best churches in Illinois? Or what about the top ten children’s ministries in the Chicago area? In our Gospel reading today, we see that the disciples were not immune to this kind of thinking. Even though they didn’t have the Internet, or Yelp, football, or even the printing press, we can still tell that the disciples were jockeying for position. Arguing and trying to figure out which one of them was the “best.” Who was the “greatest,” anyway? I think Jesus made them ashamed of themselves, since they got very quiet when He asked them what they were arguing about on the road, just before they reached their destination for the evening. They didn’t want to admit they were arguing over superficial or unimportant things like rankings! Who was the “best,” or the “greatest.” Striving for superficial, unimportant things. I suspect they already knew what Jesus would say about that kind of thinking and striving. Wow! Pretty pointed remarks, let me tell you! In other words, Jesus said that being kind to the least of society (for that was what children were, in the first century) was far better than seeking status or striving to be the “best” or the “greatest.” The disciples were right to quiet down in embarrassment when Jesus asked them why they were arguing on the road. But, all of that is preamble. Setting the stage for what I really wanted to talk about today. And yet, this sermon topic is a continuation of Jesus speaking about being kind, thinking about, and being of service to the least of society. The disciples just didn’t get it. Jesus makes His point clearly, repeatedly. Being kind to those who are overlooked or ignored? Helping out those who have little or nothing, with no thought for a “return on your investment?” The disciples misunderstand or get confused, over and over and over again. Like right here. This past week, the people of the United States had a rare opportunity to see the head of the worldwide Roman Catholic Church, in the flesh. For real. Pope Francis is here now, in this country. He arrived earlier in the week, in Washington D.C. The President, Vice President, their families, and many other members of Congress and other people in Washington were among those who had the opportunity to hear his Holiness speak to a joint session of Congress. Oh, and the Pope ate lunch with the homeless, instead of with the bigwigs at the White House. Pope Francis then went to New York City, celebrated Mass at Madison Square Garden, drove along Central Park where thousands greeted him, and visited a Catholic grammar school in a poor, Latino and Black area of the Bronx. Then, he flew to Philadelphia. Yes, he is celebrating a huge open-air Mass in the middle of town today, but he also visited a prison, as well. I don’t know how much anyone here follows news of Pope Francis, but he is a very unusual man for someone holding one of the highest religious positions in the world. A man of humility, who does not care for the spotlight. Who loves and engages with children and goes out of his way to take “selfies” with young people. He makes a special effort to visit disabled people wherever he goes. Pope Francis is fervent about being pro-life—that’s for all life, including ending abortion as well as capital punishment. He is fervent about protecting the environment—worldwide. He does not wish to be elevated or made much of. So, of course people recognize his humility, good humor, engaging behavior, and respond to him all the more! I think Pope Francis would understand immediately what Jesus was saying here. Jesus wanted His disciples to think about others, first and foremost. Not jockey for position, seek high status, or try to be the “best” or “greatest.” Not to go out of our way for standing or high rank. Jesus goes on to say, “41 Truly I tell you, anyone who gives you a cup of water in my name because you belong to the Messiah will certainly not lose their reward.” Wait a minute. What’s this? First he’s talking about considering those on the bottom rung in society as fully human, too. Not second-class citizens! Children certainly qualify for that, as do women, the elderly, the disabled, and handicapped. As do immigrants, migrants and refugees. Let me tell you about a college student bible fellowship in Europe, to give an example of what Jesus was telling His disciples. This comes from the prayer email sent out just a few days ago from the International Fellowship of Evangelical Students, IFES Global Communications. “Students with SXEF Greece are mobilising to help throughout the country. G., a staff worker in Thessaloniki, writes: ‘Greece has been one of the places on the global map where a lot of quite painful changes have taken place. Little did we realize that, in our own “neighborhood”, there was place for more suffering, until we saw the caravans of refugees and migrants crossing the borders holding their babies in their arms. 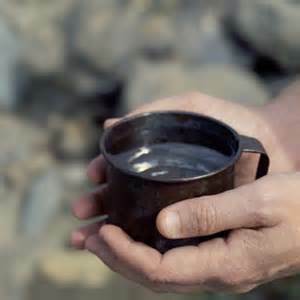 Quite literally, we are sometimes called to give a cup of cold water to people in need. Like these college students did, in northern Greece. Giving a smile, and an encouraging touch. A handshake. Holding a cranky baby or a fretful toddler, so a tired mother can have a short break. Are these big actions, or expensive things? Sometimes, no. But, they are human things. We can do what we are able to do. And with a little help from everyone, we can do a lot! Isn’t this exactly the same thing that Jesus said to His disciples, in our Gospel reading today? Isn’t this what the college student bible fellowship found when they ministered to the hungry, thirsty and tired refugees crossing through their country? Giving a cup of cold water in Jesus’ name has a huge impact. The action is not a huge deed. But the smile and handshake that accompany the water, or the food, or the supplies? Priceless. And welcoming. Showing the least of these that someone cares. Someone is concerned. They are not all alone. Each of them is made in the image of God. Just like me. Just like you. Remember, for God so loved the world. That is, the whole world. Not just part of it. Not two thirds of it. Not just people in the Northern Hemisphere or people with four good limbs. Not just people born to married parents, or the people who are sighted and can hear. But, everyone. What’s more, Jesus is calling for each of us, all of us, to look at each other and see God’s image in each person’s heart. For God so loved you. For God so loved me. For God so loved . . . each person. In Morton Grove. In Illinois. In the United States. Yes, even the whole world. When I attended seminary I had a handful of classes that were absolutely superb in every way. Interesting course material, fascinating professors, and assignments I could totally sink my teeth into. One of these courses was Reformed Tradition, taught at the Presbyterian seminary on the south side of Chicago. This course highlighted the Reformed Protestant church practices and theology since the 1500’s. And, I absolutely loved it. One of the strong memories I have of this course is studying the practices of the Reformed missionaries of past centuries who were called to cross barriers (and in some cases, also cross continents and oceans). They took the message of the Gospel to those who had not yet heard the Good News of Jesus Christ. That’s just what Paul and his friends are doing here in Acts 17. This week is the last of our Summer Sermon Series, Postcards from the Early Church. When last we met our intrepid heroes, (in Acts 16) they had crossed from Asia into Greece, into Europe. Here, in both towns of Thessalonica and Berea, they start preaching and speaking with the groups of Jews living in both areas, and they also preach to their Greek neighbors and friends. To go back to the course I loved in seminary, Reformed Tradition, I discovered that many Protestant missionaries and mission agencies had a master plan. The missionaries would not just go and preach the Gospel. No! They almost always had an excellent method behind their outreach. They not only would start a small church or chapel, but would also often develop a health clinic, sometimes even a hospital. And—the missionaries almost always began a school. They wanted to teach people; not only how to read, but also teach math and other subjects; sometimes even beginning institutions of higher learning in far flung areas. So, reading and literacy were of extremely high regard to the missionaries! This went along with the importance of each person being able to read the Scriptures for themselves. We can see that translating the Bible became a high priority, too. What does this have to do with our Scripture passage for today, you might ask? After Paul and his friends were thrown out of the town of Thessalonica, they went down the road to the next town of Berea, fifty miles away. We don’t know very much about Berea, except—the Bereans eagerly searched the Hebrew Scriptures after they heard Paul’s message. Paul wasn’t just delivering a line, or trying to pull the wool over anyone’s eyes, no! The Bereans not only read, but diligently searched and sifted through the Scriptures to make sure that what Paul and his friends were telling them was true! The literacy rate in Jewish communities has always been extremely high. For millennia it’s been this way. It’s marvelous to learn how to read, as well as do math and learn other subjects, too. Literacy has been a strong priority among large groups of Protestant missionaries, too. Reading the Scriptures is and has remained a primary goal, but just think about it. As we teach people how to read, we are also teaching them how to think, and how to reason. And, as more people in these far away mission areas learn more and more, the quality and standard of living rises in the whole community, as well! All very good things. Dr. Luke doesn’t tell us too much about the Bereans. Except, the people in the town of Berea, in the foothills of the Olympian mountains, certainly seem like “people of more noble character” than the troublemakers in Thessalonica. Luke’s word used here in this passage is a legal term. Luke states that “Paul’s appeal to Israel’s Scriptures [was] a legal ‘witness’ to warrant his gospel’s claims about Jesus.” Paul was not just making up imaginary tales, or fabricating fairy stories to put little children to sleep. No! Paul was using the Hebrew Scriptures as competent testimony to back up what he was telling them. And thus, many of the people who heard Paul out, believed what he said. Because they searched the Scriptures and made sure that what Paul was telling them matched with what they knew and already believed. It’s like fact checking, today. How many people here have “heard something” about someone famous, or about some political candidate? How many people here are not sure where they first “heard it,” but “everyone is talking about it!” Like, for example, some Internet meme or email sob story passed around from person to person that is patently untrue. But, wait! This was not the end. Paul and his missionary friends did not have an easy time of it after starting the church in Berea. The people who stirred up things in the previous town heard about Paul and company and how they were having such an effect on the people in Berea. Some of those troublemakers from Thessalonica came over to Berea and made trouble in that town, too. Talk about nasty people! So, Paul’s new friends, the new believers in the Messiah, the Lord Jesus, shipped Paul out of town in a big hurry. But the church Paul founded in Berea remained. Paul’s work here was done. We know they had a firm basis, since the Berean believers already had a solid foundation in the Hebrew Scriptures. What about us? Do we have a similar solid foundation? Thank God, we have the Bible translated into English. It was translated for us centuries ago! We can look back to the great job that William Tyndale did in the 1500’s, paving the way for the King James Version, translated just after 1600. And now, today, we have many translations! We can celebrate those translations, just as we celebrate our freedom to read the Bible, and our ability to study and learn about Scripture. There are still some places in the world today where it is a crime to read and study the Scriptures. I encourage all of you to pick up the Bible. Read a little every day. Become familiar with it. I know some of you do already. There are wonderful helps. Just ask me and I will hook you up with one! God’s Word is truly a lamp to all of our feet, just as I told the Sunday school children before the sermon. The Bible sheds light on all of our paths. Just as it was with the Berean believers, just as it was with the Apostle Paul and his friends, so it is today. Praise God for God’s Word, freely available to all of us, today. Wall, Robert W., Acts, from the New Interpreter’s Commentary series. (Nashville, Abingdon Press: 1994-2004) 239. Last Friday was a typical day, in many ways. People had a normal day of work. Since it was the second Friday in September, for most school children it was a normal day of school. Except—it wasn’t quite a normal day here in the United States after all. Friday was September 11th. 9/11. A day that will remain in the forefront of many people’s memories. I wanted to depart from the Sermon Series on Acts I’ve been preaching to bring a message about this serious and sobering day of remembrance. Yes, we remember the fateful day, fourteen years ago. The horrific happenings in Manhattan, Washington D.C. and Pennsylvania. And, we will remember the bravery of so many who served so selflessly, and gave so willingly. As I prayed about this service and what bible passage I ought to preach on, I thought of several Scripture verses. Yes, I could focus on the past, and preach for those thousands of people who died on September 11, and who since have died as a result of injuries or challenges they experienced on that day and in the aftermath. We can remember. We ought to remember. However, I also want to hold up a vision of hope. I try to keep my personal outlook on life and living firmly on hope and hopefulness. Even when looking at terribly sad events, even horrible situations, I earnestly try to see where God might have a place. Even in the worst situations, God is there. Hope is there. Somewhere. That’s the situation we all find ourselves in. We all sin. Some sins are worse than others, and more visible. Some people sin a lot! Some people have particularly hard hearts, and they walk all over others. Hurt them, and do even more callous things to them. Did you know that Jesus came into the world for them, too? Jesus died on the cross for the people in and out of jail who have committed three, four, five and more felonies, just as much as Jesus died on the cross for the people who have not been to jail. I’m getting ahead of myself. We need to take a closer look at this paragraph from the second letter the Apostle Paul wrote to the believers in the town of Corinth. 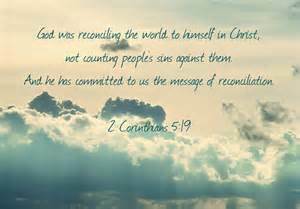 In verse 18 of chapter 5, Paul tells us that God was reconciling us to Himself. Wait a minute! That sounds like making peace and harmony. Reconcile? That is not a term for a mean, angry God, one who just wants to smite anyone who gets in the way! Do you know a bookkeeper? Has anyone here ever reconciled accounts, or financial statements? I mean, taken two separate and different lists of numbers, and make them compatible? See that both are in agreement? That’s another way of thinking about reconciliation. Our accounts, the deeds that we’ve done, the words spoken, the thoughts that go through our heads? The long lists of those things on our accounts are reconciled to God’s accounts. I want to be up front and clear. I am a sinner. I freely admit that. I am stained with the dark stain of sin. But God—but God removes that stain. Through the provision of God’s love, through the coming of Christ into the world, through His death on the cross and resurrection from the dead, the stain of sin has been taken away. And, I am reconciled to God. Do you hear? The sins, the awful things I have done, have been cleansed, and taken away. That’s not only me, but it’s you, too. All of you. All of us! I am going to talk now about some disturbing things. If anyone wishes to leave, I will not be offended at all. I wanted to let you all know before I spoke about it. It is terribly upsetting. I’d like to take a detour, and tell you about a woman. Eva Mozes Kor. Eva and her twin sister Miriam—born in 1934, and their family were from a small village in Romania. They were the only Jewish family in their village. Shortly after the Nazis took over that area of the country, Eva, Miriam and the rest of their family were taken to a Jewish ghetto in a larger town and they lived there several years. In 1944, their family was shipped to the Auschwitz death camp. The twins’ parents and older sisters were immediately killed. Since Eva and Miriam were identical twins, Dr. Josef Mengele wanted them as human guinea pigs for horrific medical and genetic experiments. He and his team abused approximately 1500 twins; that’s 3000 children and young people. Eva and Miriam were among about 200 children liberated from the camp by the Soviet Army in January 1945. Almost all of these were twins abused by Mengele. Eva spent years working through her deep-seated feelings and emotions about being in the death camp. She finally came to the place where she made a decision to forgive those who had harmed her, because she needed to take this critical step for her own, personal mental health and well-being. It did not happen overnight. It took a long while. But now, she has forgiven those who harmed her, her family, and those she loved. What I am wondering: does God need to do deep thinking before God forgives people? When I sin against God, and knowingly do things displeasing to Him, how does God feel? Now let’s multiply that times all of the people in the state of Illinois. Make that all the people in the United States. No, let’s up that to all of the people alive today. Does God need to do deep thinking, working through deep-seated feelings and emotions, before God forgives the world? Consider verse 19: “God was reconciling the world to Himself in Christ, not counting people’s sins against them.” God satisfies God’s anger, enmity and displeasure through Jesus Christ. Jesus and His mediation—He steps in between and takes the burden of sin for us. Jesus restores the world—that’s all of us—to God’s love, nurture, caring, and favor. In the original language of Greek, the word “reconcile” has the meaning “obtain the good favor of” or “lay aside enmity.” That is exactly what God does for us. But God justly ought to be filled with righteous anger at us. At all of us! We sin. We go against the things we know very well that God wants us to do or to think or to say. Or, we go out of our way to do or say or think things that out and out displease God very much! But God forgives us. God reconciles us to Himself through Jesus and His death on the Cross. Eva Kor and her forgiveness of those who hurt her and her sister as well as those who killed her family and others she knew is one way for us to begin to understand the huge amount of forgiveness and reconciliation that God has accomplished on our behalf. That’s all of us! On all of our behalfs. Eva Kor not only is “a Holocaust survivor and a forgiveness advocate, and public speaker. Powered by a never-give-up attitude, Eva has emerged from a trauma-filled childhood as a brilliant example of the human spirit’s power to overcome. She is a community leader, champion of human rights, and tireless educator.”  She has founded a Holocaust museum in Terra Haute, Indiana, and my friend Josh Thomas who started and maintains the Episcopal website www.dailyoffice.org had Eva as their Daily Office retreat speaker several weeks ago. She has a brilliant and straight-forward definition of forgiveness. “Forgiveness is a way of healing oneself from pain, trauma and/or tragedy.” I’m including her further explanation on the hand-out in your bulletins. So, God’s forgiven me! Amen! God’s forgiven you, too! Amen, again! But wait—there’s more! God has also given us—that’s you and me, and all of us—the message of reconciliation. The ministry of reconciliation. What a wonderful way to show people the power of the Gospel, the Good News of Jesus Christ. We can show people love, caring, nurture, and forgiveness. Each of us can reconcile ourselves to one another whenever we go astray. Or whenever anyone says a mean word, or does something unkind. Is there any way more powerful to show God’s love and care? I don’t think so. Yes, this is really hard, sometimes almost impossible. It is so difficult to show love and caring for those who have hurt us, and have been mean to us. And have been uncaring, unkind, even cruel and heartless. Like Eva forgiving those in the death camps. Or, for those who have been enemies in war. Or even for murderers or terrorists. That’s why we can go to God. We can ask for help to show God’s love. God’s forgiveness. God’s reconciliation. So, help us, God. Amen. Most people I know like things in order. Neat and tidy. Under control. I mean, most things. Steady income, check! Roof over our heads, check! Clothes to wear and food to eat? Check and double check. Sure, we can have little surprises now and then, but most people crave order. Everything’s hunky dory! Just the way it’s supposed it be. Until, it isn’t. We experience things spinning out of control. 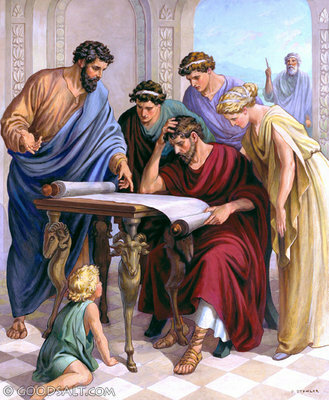 In our Scripture reading today, we have Paul, Silas, Dr. Luke and their missionary friends in the town of Philippi. This is another in our summer sermon series, Postcards from the Early Church. If you remember last week, we met Lydia, a Gentile woman. We are told she is from a city called Thyatira, and is a dealer in purple cloth, which for that time was a luxury item. What I suggested last week was that it’s similar today to a dealer in high-end designer clothing in our culture and context. She not only owns her own business, but she also has her own house. The pertinent part for us in this week’s sermon is that after becoming a believer in the Lord Jesus Christ, Lydia invites Paul and his friends to stay at her large house in Philippi. Paul and friends start to carry out the challenging work of starting a church plant. That is, spreading the Good News of the risen Lord Jesus. Paul is skilled at debate, and I suspect he and his friends went to gathering places all around town to talk with people. To tell them about the Good News about the Lord, how He died for our sins and was raised from the dead, conquered death, and has ascended to heaven. Here Dr. Luke gives us a thumbnail sketch of this slave girl. Yes, she is telling the truth. Paul and his friends were telling people the way to be saved. But, the truth can be twisted. She refers to “the Most High God.” Meaning, a God among other Gods. And, in the polytheistic environment of Greece, the title “the Most High God” was also a common name for Zeus, ruler of the Greek pantheon of gods. This slave girl was a factor completely out of the control of Paul and his friends. From what this looks like, she was a sort of a heckler. Walking after them, shouting and making a big fuss. And, the slave girl was a local. A known person to the inhabitants of the town. Paul and his friends were visitors, strangers in town. There was that dynamic, as well. Not only is she starting to get irritating and annoying, following them around like a pesky little sister for many days, Paul realizes this slave girl is energized by a demon. The demon inside of her enabled her to tell fortunes, to tell people what would happen to them in the future. I suspect the demon knew with great certainty the exact identities of Paul, Silas, Dr. Luke, Lydia, and the rest of the believers in the risen Lord Jesus there in Philippi. What was that that happened? Paul got fed up with the persistent heckling the demon—I mean, the slave girl was doing. So, he cast the demon out of this slave girl. Next thing we know, the girl’s owners got really mad! That was a serious consequence, to be sure. Let’s trace this back a bit. Why were her owners so angry and upset? Apparently, the slave girl’s owners didn’t particularly care that she wandered around the city of Philippi shouting about Paul and his friends being servants of God and telling people how to be saved, as long as she pulled in the money. As long as she was a profitable cash cow, her owners were happy. But in casting out the demon? Talk about things spinning out of control! The unexpected consequences of Paul’s action? It dried up all the profits the girl’s masters were making! Paul dried up the owners’ lucrative source of revenue! Talk about hitting them in the pocket book! With you and with me, today. What about us? Is “Religion” all well and good, until it hits us in the pocketbook, too? Is “Religion” affecting our bank accounts? Will following Jesus here in the United States affect us in a negative way? Affect our pocketbooks? Or, is that hitting too close to home for us? Hmm. I’ll let us think about that for a while. Let it sink in. Things are spinning out of control again. Paul and Silas are thrown into the inner cell of a prison. I bet that was an especially secure place. But what do they end up doing? Instead of crying and desperately lifting their voices in prayer to God, they begin to sing. Imagine, singing hymns of praise to the Lord, at midnight. Securely locked, in a dark prison. We can see the economic effect this earthquake had on the jailer, for sure! Plus, the horrible sinking in his heart, seeing his jail destroyed, with the prisoners quite possibly running away, escaping in the middle of the night. No wonder he drew his sword, ready to kill himself. Did you hear? What must we do to be saved? Believe on the Lord Jesus. It doesn’t matter what is spinning out of control. It doesn’t matter what economic consequences are happening. It doesn’t matter what the authorities say or don’t say. Instead, we hear the Good News preached to us. 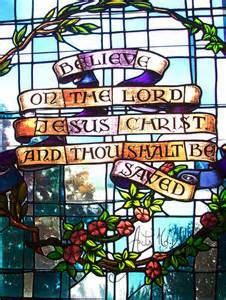 Believe in the Lord Jesus, and we will be saved. All of us, and our households, too! On this Labor Day weekend, we can see all levels of society hearing the Good News. We can see the slave girl—a slave, someone from the lower class, being freed and exposed to the saving grace of the Lord Jesus! And, we can see the jailer, a solid member of the middle class, receiving salvation with joy! And last week, we saw Lydia, a member of the upper class in Philippi, listening eagerly to the Good News. She came to faith in the Lord Jesus, too. Our Lord Jesus is not only for the Gentile and the Jew, not only for male and female, but Jesus also transcends all class distinctions. All separations of caste, of nationality, of ethnicity, of background. That’s how it was in the first century, and that’s how it is today, too. What about you? Do you believe in the Good News? Do you believe in the power of Jesus to forgive your sins, and help you to walk with Him day by day? As I proclaim each week after our Confession of Sin at the beginning of the service, “Believe the Good News of the Gospel. In Jesus Christ we are forgiven!” Alleluia, amen!